Make sure you see this show. It’s like going to church. The Holy trinity is there. All the gear of Clapton Beck And Page. I’d post some closeup pics but this site drives me crazy with the uploading nonsense. Clapton’s Blackie and fool SG. Becks Telecaster from the yardbirds. Page’ whole live rig Marshalls and effects. Dano, number 1 les Paul, and doubleneck. His dragon Telecaster and Supro from LZ1. Hendrix’s Flying V And strat from Woodstock. Eddie Van Halen’s rig and Frankenstein guitar. Kieth Richards stage rig and Mcawber tele. 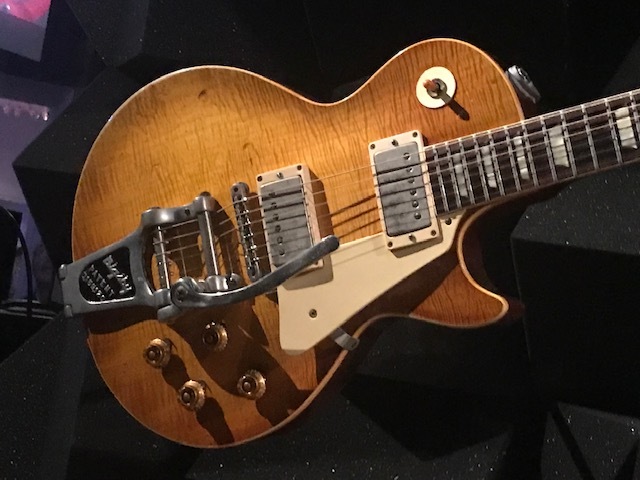 And bixby Les Paul from Ed Sullivan 64. Elvis first acoustic. Chuck Berry’s guitar he recorded Johnny B Goode with. A prototype tele from 49, a 54 strat, and an unidentifed 59 burst. And much much more. Love to see those pictures if you could persevere with the hosting thing...imgur perhaps (free and easy to use) ? A simple right click to save image in imgur, then right click again to paste it into your post. A bit of a faff first time, but simple after that. Shakespeare walks into a pub, the Landlord says "get out, you're Bard"
This is from the Met ? Ok Lads, let's see if this works. Thank you for posting these! No problem, glad the link works. These are bluesroom's work, I'm just the postman. Oh. Fantastic, thank you bluesroom. Still stands that I am very jealous! Really appreciate you sharing these here. I’m not too shabby. Thanks man. See you at Haydock if you're around.